Diseases of the cardiovascular system are occupied today at the first place in the world and are a major cause of hospitalization and death. Mother Nature has given us few plants & minerals that can naturally maintain a healthy heart. Cardiar formula is a natural combination of best plants and minerals that can maintain the heart muscle tone and blood flow in this important organ. Thanks to the ancient healing system that gave us a natural plant to boost immunity and strengthen the heart muscle, specially designed one of the best cardio-tonic medicine Sattva Cardiar capsule. Sattva Cardiar capsules helps to regulate serum lipids by lowering cholesterol, triglycerides, and lipoproteins of low and very low density. It also maintains the level of high density lipoprotein, which protects the heart from various problems. Sattva Cardiar capsule reduces platelet aggregation. This will reduce the sensitivity of the heart to adrenergic stimulation. Powerful plants & minerals used in the preparation Sattva Cardiar capsules improve cardiac contractility & help to strengthen the heart muscle and eliminate toxins from the blood. Sattva Cardiar capsule helps to lower high blood pressure, and is also useful in the treatment of diseases such as atherosclerosis. Sattva Cardiar capsules made from plants and minerals that help to improve blood circulation, strengthen the heart muscle. It reduces blood pressure and acts as a heart tonic. 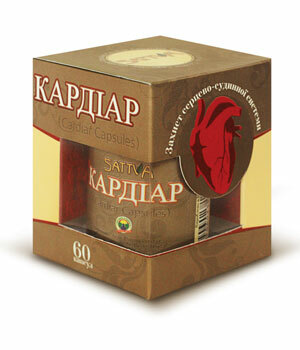 Sattva Cardiar capsule also contain plant such as Ashwagandha, which is regarded as an excellent remedy for stress. Sattva Cardiar capsule - well combined ayurvedic medication that from the first days of treatment improves heart, arresting heartaches, arrhythmia, chest tightness, shortness of breath, palpitations, relieves general fatigue and normalizes blood pressure and digestion. People who are prone to heart disease or suffered a minor heart attack, it is recommended every year for at least 3 months, to use Sattva Cardiar capsule. Against the background of proper nutrition and moderate exercise, it has a stable regenerating effect on the cardiovascular and digestive system. The heart pumps blood throughout the body. It supplies oxygen through the blood of all the tissues of the body through the arteries. After cells absorb oxygen and nutrients from the blood, venous blood returns to the heart. Venous blood is pumped to the lungs, where it picks up oxygen and returns to the heart. Thus, to maintain the normal functioning of organs in the body, the heart should remain healthy. Nevertheless, the heart is also susceptible to diseases. Elevated cholesterol is a major cause of coronary artery disease. Low density lipoproteins and triglycerides are accumulated in coronary arteries. Over time, the deposition of lipid in the blood vessels, and solidified to form plaques, which promote slow down blood flow to the heart muscle. A heart attack occurs when the blood supply to the heart muscle is completely prevents by blood clot. High blood pressure, diabetes, obesity, smoking, peripheral vascular disease increases the risk of heart disease. Some herbs can reduce the risk of heart disease. They improve the heart muscle, preventing the formation of plaque in the arteries by reducing blood pressure levels and increase antioxidant blood components. For hundreds of years, plants such as Arjuna, Ashwagandha, Tinospora and Guggul effectively used for the treatment of cardiovascular diseases. The efficiency of these plants to improve the quality of life of people with heart disease has been proven in a number of experimental and clinical studies. These powerful cardio protectors are part of the medicine Sattva Cardiar capsules. Punarnava (Boerhaevia diffusa) and Shilajit (Asphaltum) - beautiful kidney tonic - having a diuretic effect, increases the amount of urine, reducing the swelling and the total load on the heart muscle. Shilajit also helps to strengthen blood vessels and lungs. Ashwagandha (Withania somnifera) - activates anabolic processes, promotes tissue regeneration, used for general weakness of the body, long-term chronic diseases, fatigue, insomnia, nervous exhaustion. Guggul (Commiphora mukul) - perfectly reduces triglycerides and cholesterol in the blood, has an antioxidant effect, especially with regard to low-density lipoprotein, accelerates their metabolism in the liver, binds in the gut fat and cholesterol, stimulates the thyroid gland - which also contributes to lowering cholesterol, protect the myocardium from damage by free radicals, anti-inflammatory effect. Vidanga (Embelia ribes) - used to kill parasites, improve intestinal motility, cleansing the liver and blood. Guduchi (Tinospora cordifolia) - increases the activity of the immune system, increases resistance to infectious diseases, prevents the development of fibrosis and stimulates the regeneration of liver tissue, lowers blood sugar and blood urea. Acts as bitterness - has a laxative effect, promotes discharge of gases, improves digestion. Musta (Cuperus rotundus) - effective stimulant of digestion. Improves absorption in the small intestine, has a diuretic effect. Suvarna Basma (Ash of Gold) - Ayurveda is considered the best in cardiac and vascular tonic. It promotes cell regeneration and with ashwagandha strengthens blood vessels of the brain, restores the nervous system and helps restore the body's vitality (ojas). Oxide of gold the best means for the prevention of stroke and heart attack. It is considered a powerful tool for the extension of youth, strengthen joints and blood vessels, and restore sexual disorders. Prevents premature aging of the body, is a powerful antioxidant. Helps with chronic fatigue, insomnia, nervous disorders, normalizes blood pressure. A balanced diet and regular physical activity can reduce the risk of heart disease. Healthy food should consist of six or more servings of grain products. The largest share of carbohydrates in the diet should come from whole grains. Whole grains contain vitamins, minerals and dietary fiber. Include five servings of fruits and vegetables in your daily diet. Eat high quality proteins, such as lentils, peas, beans and low-fat milk and dairy products. Limit your intake of saturated fats - such as butter, cream, cheese, red meat and other foods high in fat. Mono- and polyunsaturated fats are good for the heart. However, total fat intake should not exceed 30% of your daily caloric intake. Avoid fried foods and bakery products containing hydrogenated fats. Daily calorie intake should be commensurate with the level of physical activity. Limit your daily salt intake to 2.4, the Food and drinks with added sugar increases the risk of obesity. Exceeding the norm of alcohol can damage the cardiovascular system. Quit smoking. The chemicals in tobacco smoke are toxic to the heart muscle. Smoking accelerates atherosclerosis, or narrowing of the arteries. This is especially bad for the heart women taking oral contraceptives. At least 30 minutes of moderate exercise, such as brisk walking, jogging, swimming, aerobics, strengthen the heart muscle. Even normal operations of the housework, gardening or daily walks help burn calories and improve heart function. People with hereditary diseases of the heart should be more conscious to control cholesterol, blood pressure and blood glucose level. Arjuna (Terminalia arjuna), Nirgundi (Vitex negundo), Rasna (Pluchea lanceolata), Mokoi (Solanum nigrum), Guduchi (Tinospora cordifolia), Punarnava (Boerhaevia diffusa), Chitrak (Plumbago zeylanica), Musta (Cuperus rotundus), Vidhang (Embelia ribes), Ashwagandha (Withania somnifera), Shilajit (Asphaltum), Guggul (Commiphora mukul), Rajat Bhasma (Ash of Silver), Swarna bhasma(Ash of Gold). Ischemic heart disease, angina, arrhythmia, hypertension, tachycardia, cardiac pain, painful palpitations, heart failure, general fatigue.